Meet my summer salad obsession . . . 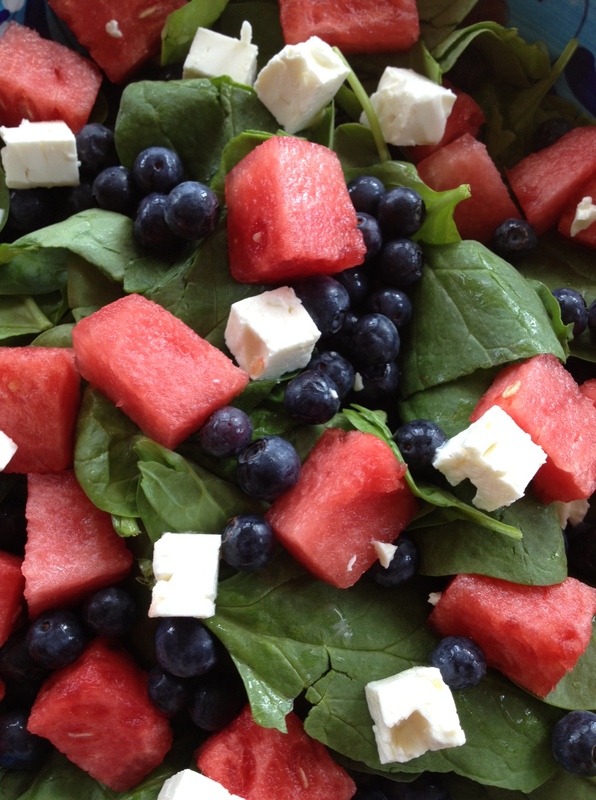 Spinach Salad with Watermelon, Blueberries and Feta. It’s a recipe I got from my friend, Delilah. It’s light, delicious and gorgeous. The dressing is just lemon juice and honey. That’s it. Summer simplicity. And if you’re lucky enough to have a friend who happens to be a beekeeper, then you get to use fresh, local honey! Thanks, Fern Hill Apiary! Whisk the lemon or lime juice and honey in a large bowl. Add spinach and toss lightly to coat. Add watermelon, blueberries, cucumber, and onion. Toss and top with feta cheese. Note: I rarely add the red onion — I find it overpowering. And I didn’t have any cucumbers today — and the salad tastes just as good without them. I love flexible food. Now for the challenge . . . what wine should I pair with all this summer goodness? There’s a lot going on in that bowl. Let me know your ideas in the comments! You want acidity for sure and a little sweetness to match up with the fruit and honey. I definitely would prefer bubbles for this salad, so I’d go with a Moscato D’asti. The bubbles will cleanse and refresh the palate and the sweetness will keep everything in balance. If you don’t want sweet, then I’d go with Prosecco. Oooh! Love the Moscato d’Asti idea . . . and I think I even have some in the fridge! Thanks for stopping by, modernsomm! Salud! No problem! I’m going to try that salad recipe; it sounds delicious! This is one of our favorite (and simple go to) summer salads sans the honey. We have this salad on the deck with Rose to veg out. Sans honey? I think I’d be making a pucker face! ;o) Rosé is a terrific idea . . . and visually pretty, too! Thanks for the input, Frank! Salud! I know what you mean with these easy summer salads. I hardly crave more when the weather is like this: just fruit (I like mine with peaches, plums, apples and avocado) and spinach. Then some parmiggiano on top…yum. Vinho Verde is an interesting option . . . love the greenness. You summer salad sounds perfect! Salud!! 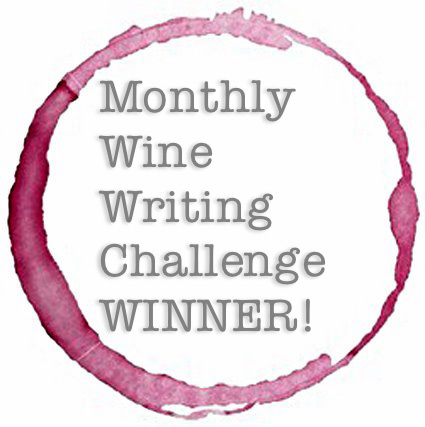 This is one serious challenge – there is a lot going on for a simple wine pairing. 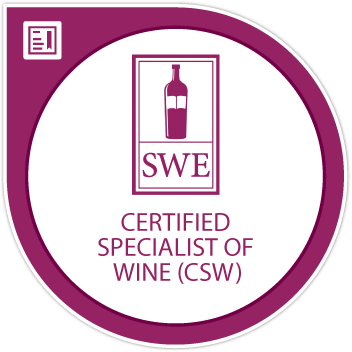 I would try to complement it and not to contrast (blueberries, honey, watermelon – ouch), thus I would suggest a nice German Riesling (probably Spatlese or Auslese), or (call me crazy) Sauterns. Riesling was my first thought, too. But I thought Kabinett instead of Spatlese. Sauternes is an intriguing idea. I should gather all the suggestions and do a pairing throw down! ;o) Salud! No questions, Kabinett will work fine too – overall, it will depend on the year and producer. Will be an interesting experiment and cool blog post! My there is a lot of different ideas in the comments! I would pair it with a nice refreshing crisp Sauvignon Blanc – probably one from New Zealand. Let us know what you try! This salad sounds divine!! I love summer simplicity… farm to table at its best. I, too, hope that you share what paired well in a follow up post. as a beekeeper, my little ears perk up whenever “honey” is mentioned. this salad sounds divine, and i think i shall pare it with a german riesling. cheers, my dear! Wow! You’re a beekeeper, too? Awesome. I LOVE my friend’s local honey. My kids have gotten so spoiled . . . they won’t even let me buy “store” honey anymore. Riesling was my first thought, too. Salud! This dish is sure a wine pairing challenge, with all that sweetness and a touch of acidity from the dressing. I second Anatoli’s and Modern Somm’s suggestions: I would certainly go by association (not by contrast), preferably with an off-sweet wine (not all the way sweet given the presence of spinach and feta) with good acidity and intense aromas: when I read your post the first wine that popped to my mind was the off-dry Le Colture Prosecco that I just recently reviewed (I think it would really go well with your dish) or a German off-dry Riesling (Spatlese, I guess). I like the idea of pairing by association here . . . I can’t wait to try all the suggestions! Salute, Stefano! I think I would go with a crisp dry Rose’. Rose’ pairs with ANYTHING! Agreed, RWD! Rosé is perfection . . . Salud!